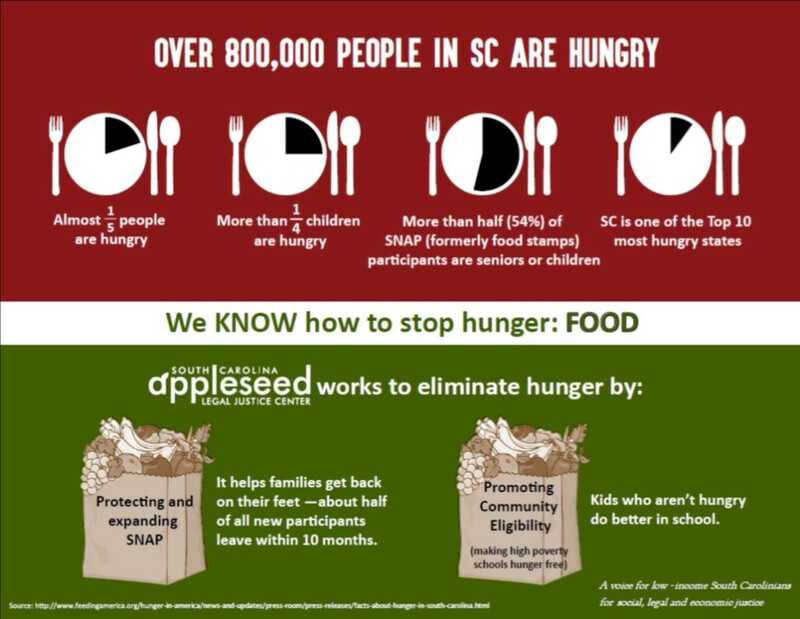 Every once in a while a program is available that makes us very excited here at SC Appleseed because it gets to one of the core issues, like hunger, that we are attempting to address – the Community Eligibility Provision (CEP) is one of those programs. 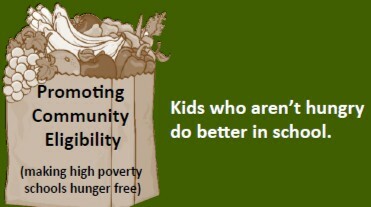 Schools in high‐poverty neighborhoods are able to offer both breakfast and lunch at no charge to all students while eliminating the traditional school meal application process if they can document that more than 40% of the children enrolled are eligible for SNAP or in Foster Care. Schools across the country and South Carolina have successfully implemented this new option and are seeing the many benefits of ensuring that all of their students have access to healthy school meals. Currently more than 250 schools, including some that have full district participation have adopted this provision making feeding hungry children a priority in their community. Thanks to the generous help of our national partners, the Center on Budget and Policy Priorities and FRAC, we are working to ensure every eligible school in our state participates in this program putting us almost half way to the finish line of all 550 eligible schools. It lessens administrative work – schools no longer have to collect and verify school meal applications and can focus on feeding children. It also increases participation in school feeding programs – in the initial pilot states, schools that implemented the provision for two years increased breakfast participation by 25 percent and lunch participation by 13 percent. CEP also facilitates implementation of alternative breakfast service models – when schools don’t have to collect fees or count each meal served by fee category, they can simplify the process and implement breakfast in the classroom and “grab and go” service models that can boost participation further. With tight budgets in all school districts, it improves the financial viability of school nutrition programs. When participation increases, school districts can take advantage of economies of scale, and reinvest additional revenue to improve nutrition quality and provide staff training. It also eliminates unpaid meal fees as when all children eat at no charge, the school district does not have to collect unpaid fees from families. 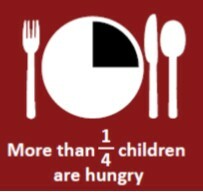 The most important part of this program is – it feeds hungry children. al assistance and work with eligible schools to help implement CEP. If you think your neighborhood school might be eligible, we would love to help them. CEP offers a stepping stone out of poverty by addressing childhood hunger so we can give all our kids a chance. To learn more about hunger in South Carolina, download our infographic – and then share with your friends! ← The Abbeville Districts: Who’s Going to be Let Go?